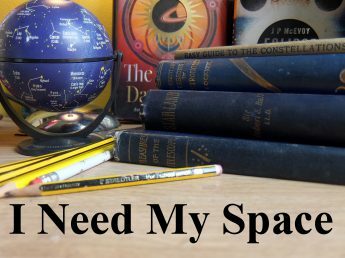 Summer 2016 Observations Part 2 | I Need my Space! First published in Lyra, the newsletter of the Wolverhampton Astronomical Society, December 2016. Deep sky observing in the summer can be quite a challenge. When we talk about ‘deep sky objects’, we’re generally referring to things like Nebula, star clusters, galaxies etc, pretty much everything that’s not a single star or a planet. The astronomer Charles Messier made up a list of the most interesting deep sky objects and we still use his listings and his ‘M’ numbers today. These objects can sometimes be quite faint, and when the sky is bright they can prove elusive, but it’s worth the hunt. Messier objects are some of the most fascinating things in the night sky. The constellation photographs I’m using to illustrate this article were all taken by me this year using a Fuji XF1 (which is a small compact camera, not an SLR) on a small tripod. Most shots were between 20-30 second exposures at f1.8 and 100ISO, using a two second timer to eliminate camera shake, (picture 1) shows the area of sky looking west after sunset, towards Corona Borealis and Bootes). To locate the deep sky objects in this article, I’d recommend a sky-atlas. My favourite is ‘Turn Left at Orion’, published by Cambridge press. Amongst the first stars you see in the summer, as the sun sets and the sky darkens, are the stars of the ‘Summer Triangle’. 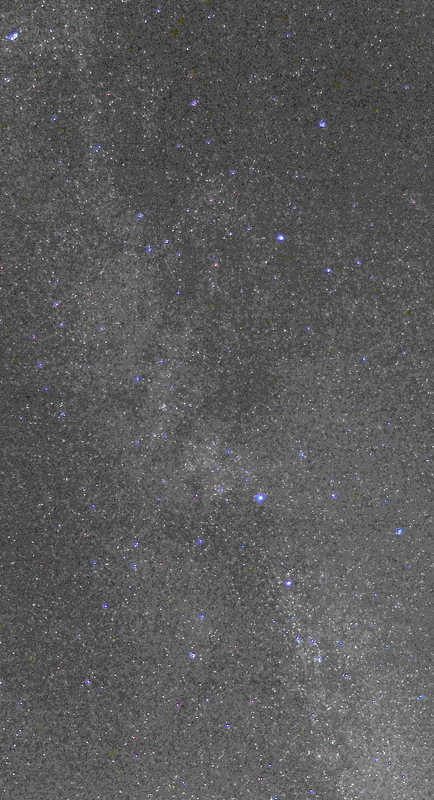 Deneb, Vega and Altair, in constellations of Cygnus, Lyra and Aquila respectively. Vega shines right overhead in Summer, a bright beacon, and it’s always a welcome sight. Four stars near it form a ‘squashed box’ shape that makes up the constellation of Lyra, and in between two of these stars is M57 – the famous Ring Nebula. The Ring Nebula is a planetary nebula, a big ball of gas, like a donut-shaped cloud, easily visible through my 8″ scope. It’s very pretty, and always seems to be my first deep-sky port of call in the summer. There’s a faint central star, which I’ve yet to see through my 8″, but using averted vision (looking slightly away from the object, where the eye has more light-sensitivity), I’m hoping to see more detail from M57 in the future. I could easily see the central star (which illuminates the gas cloud of the nebula, so I’ve read), in my previous 10″ scope. Be prepared for it to appear small, and quite colourless compared to the Hubble-type pictures you see in glossy magazines. But the thrill of seeing it with your own eyes more than compensates. 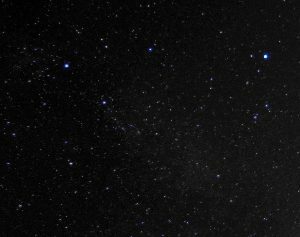 Next to Lyra, is the huge cross-shape of Cygnus the swan, and the first thing I tend to steer my scope toward in this constellation is the beautiful double star Alberio. The star at the foot of the cross. It’s well worth seeking out, as it’s easily split, and the contrast in the colours is superb. I see blue and gold. When people approach me in the camping field, (“ooh, you’ve got a telescope!”), Alberio is on my list of ‘wow’ objects to show them. 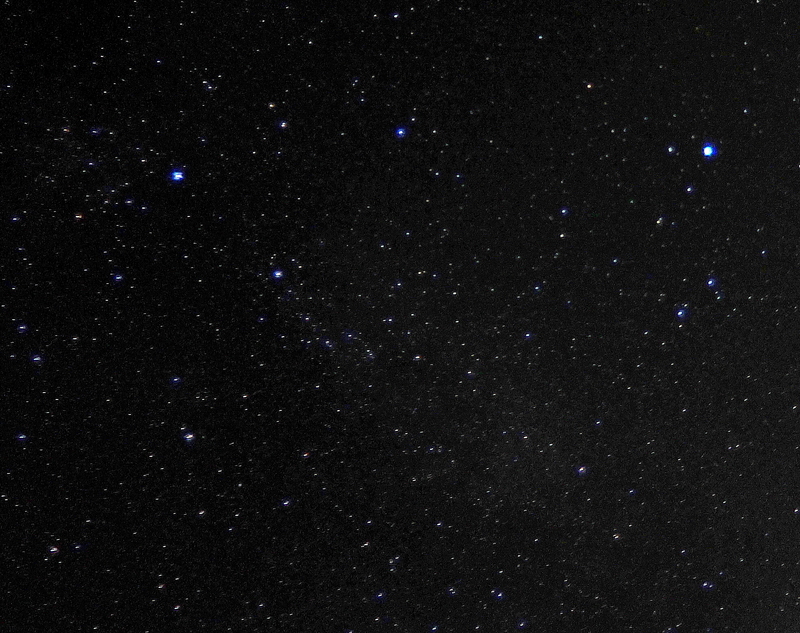 In picture 2, the constellation of Cygnus is on the left, and Lyra (with the brightest star, Vega), on the right. 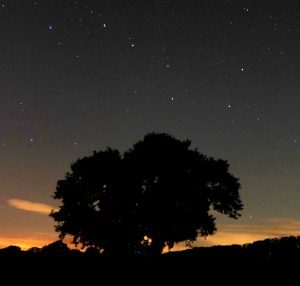 Whilst I’m talking about double stars, if you look towards the north-west, as sun sets, you’ll see the Plough (Ursa Major) quite low in the summer, (picture 3). The middle star of the handle is another cool double, they’re called Mizar and Alcor. It’s not as pretty a double as Alberio, the stars are both white, but for the beginner looking for their first double star, it’s very easy to find. From my notes, I see I tried to split the ‘Double Double’ in Lyra, without success. In August, I was able to split them, and it was a very pleasing sight. I put this down to my telescope being collimated at the last WOLVAS meeting before the summer (thanks again Dave!). I see I’ve again noted how pleased I was with the optics on my Skywatcher. The stars were pin-sharp. Globular clusters listed in my notebook this year are M13 & M92 in Hercules, and M15, which I’ve listed as ‘in Aquarius’ but it’s actually in Pegasus. These large, sprawling constellations are hard to navigate I think. I’m happy to admit the whole south-east part of the summer’s sky is difficult for me to navigate. I don’t have a ‘go-to’ telescope, and prefer using maps. I know this limits the amount of objects I see at night, but there’s a certain satisfaction that comes from finding an object yourself. Plus, using maps helps me recognise the constellations. Globular clusters can be seen as fuzzy ‘blobs’ in small scopes and binoculars, but a larger magnification can show the individual stars, especially on the edges. M13 in Hercules is possibly the best example, and a great starting point. It’s also known as ‘The Great Cluster’. 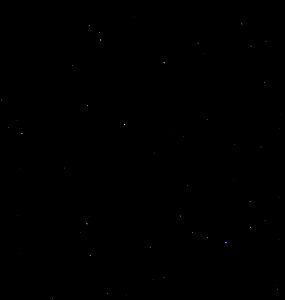 Picture 4 shows Hercules, with the ‘U’ shaped Corona Borealis bottom right. If you want globular clusters, start with Hercules. In late August I have several entries for M31 – The Andromeda galaxy. This can sometimes be disappointing, if one is used to seeing colour pictures, showing dust-lanes and spiral arms. I see from my notes I found it to be a ‘long smudge’ under a sky not properly dark, even at midnight, in early September. Its small companion galaxy M32 was spotted too. Using averted vision I could see more structure in the Andromeda galaxy. As the night grew darker, I’ve noted Andromeda was a naked eye object. M33 in Triangulum is also a naked eye object if you’re lucky enough to be under very dark skies, which I wasn’t this year, and there’s no entry for M33 in my notebook. Another galactic failure this year was M64, the ‘Black Eye’ galaxy in Coma Berenices. I’ve seen it before, but this year the low placing of the constellation and the faintness of the galaxy meant it eluded me. But let’s not forget our own galaxy, the Milky Way. The summer’s the best time to see the Milky Way. 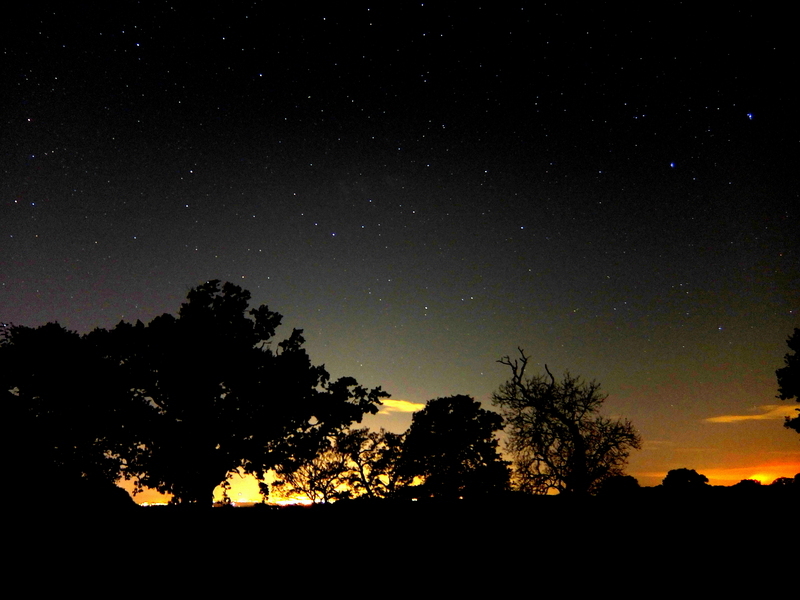 Picture 5 was taken only a few mile outside Wolverhampton, showing the area between Cassiopeia and Cygnus. On this night, the Milky Way was hardly visible, the seeing being particularly bad, yet a 30 second exposure with my Fuji compact just about captured it. After my deep-sky and planetary observations, and with the telescope packed safely away, I usually get to the part of my observing session that I enjoy as much as using the telescope. I get the chair out, pour a drink and make a final scan of the sky with an old battered pair of 10X50 Binoculars. 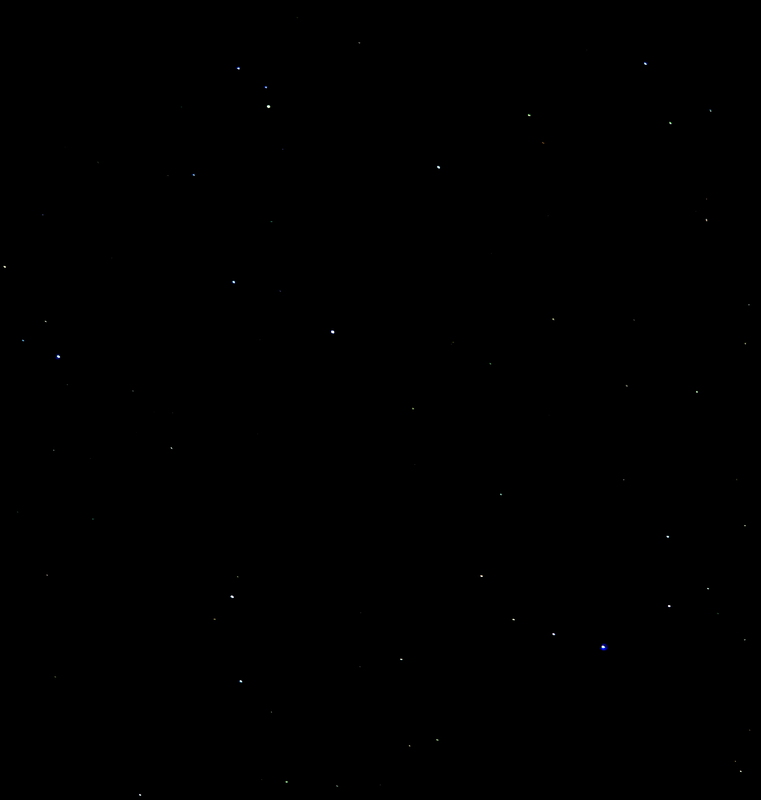 I can’t recommend binocular astronomy enough, you really get to see some lovely wide-field views. One ‘constellation’ I love, which rarely gets talked about, is The Coathanger. Its by Cygnus, in the rather silly constellation of Vulpecula (sorry, but it’s almost un-recognisable as a constellation!). It’s a none-related ‘cluster’ of stars forming the shape of a coat-hanger, it’s also called Brocchi’s Cluster. Then I visit one of my very favourite constellations. Perseus, (or ‘The River of Stars’ as I call it). 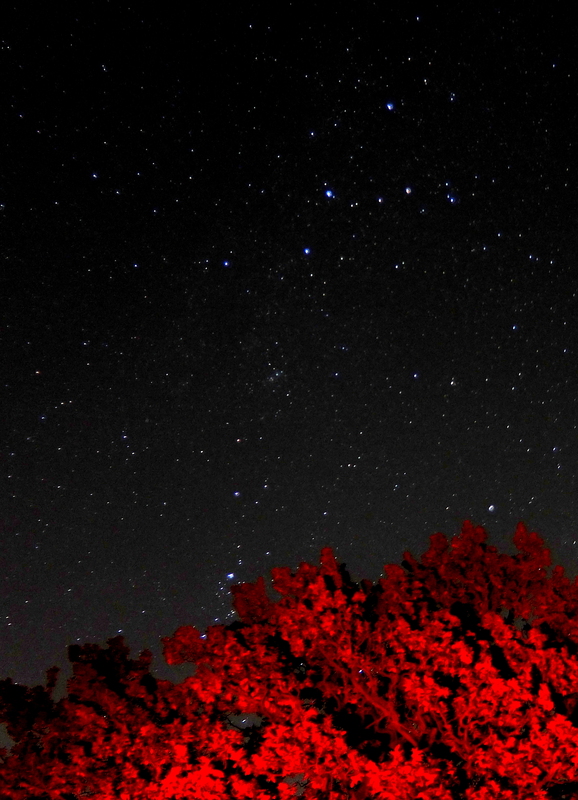 Just to the left of Cassiopeia, it trails down towards the ground in the summer, like a meandering stream of diamonds. It contains some fantastic star clusters, there’s a lovely double cluster, (NGC869 and NGC884), and I don’t think I’ve ever had an observing session without visiting this cluster. 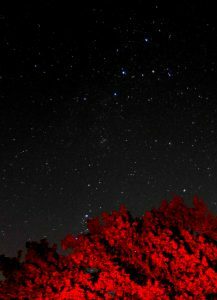 You can see Perseus in picture 6, trailing from Cassiopeia down towards the tree, (which wasn’t really red, I just illuminated it with my red astronomer’s torch for artistic purposes). 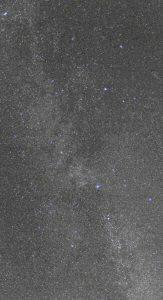 If there’s a clear summer horizon, it’s quite amazing to turn your binoculars towards the galactic centre, in Sagittarius, and see the myriad of stars there. I think we can often worry too much about ‘list-ticking’ astronomical objects when we’re observing. I also like to take time to enjoy the constellations themselves. We don’t get enough clear skies, and surely one of the greatest astronomical sights, is a clear night sky itself. As I look through my observation notes, I see there are many summer constellations with rich pickings that I’ve yet to visit properly. Sagittarius and Capricorn spring to mind. Being low constellations, I’ve never had the clear horizon to explore them fully with my ‘scope, only my binoculars. It brings home to me how hit and miss practical astronomy is, in the UK. In fact, all over the summer, due to the weather, I’ve only had a handful of proper clear nights. Perhaps less than ten, in all. Last November I spent five days with ‘scope at the ready in the Elan Valley (recently designated an official dark sky area), hoping for clear skies, yet it was overcast completely. For the last few years, I really do believe amateur astronomers have had quite rotten luck with the weather. So when we do get a clear night, it’s important not to waste it! I hope you’ve enjoyed reading about my observations over the summer. I know there’s nothing included of major interest to the seasoned astronomer, but perhaps if any society members are starting out with practical astronomy, hopefully these reports might give them some new info or encouragement. Thanks for reading!